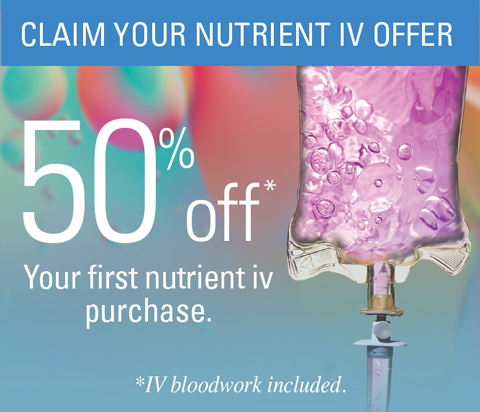 Nutrient IV therapy is the fastest, most effective way to optimize your vitamin, nutrient and mineral levels to rapidly replenish your health and revitalize your entire body. By instantly infusing essential ingredients straight into your system, you can bypass the gut and guarantee optimal absorption. IV therapy is scientifically shown to alleviate symptoms and reverse conditions related to stress, sleep, moods, migraines, depression and autoimmune disorders. Revel in relaxation and indulge in the bliss of our spa-like setting as you re-hydrate and recharge. Recharge your system with a healthy dose of hydration plus all the energy enhancing benefits of B and C vitamins. A supercharged dose of amino acids plus vitamins and minerals to power your workout, extend your performance and improve your recovery. Combat the feelings of a hangover, replenish lost hydration and rebalance your body after a long night out with this specialized and soothing formula. An extra boost of vitamin C plus the famous Myers’ Cocktail blend to enhance your energy, detoxify your body and soothe your mind. If you’re feeling fatigued, dehydrated, or even hungover, this revitalizing treatment can give you the vitamin B12 energy boost you want, along with the complex B vitamins you need, and the hydration you crave to feel your best. This energizing IV can help you feel hydrated, recharged, and ready to meet the demands of your active lifestyle. Quench your body’s need for nutrients – especially after a late night – with this replenishing, rehydrating treatment. Our most common IV infusion is ideal for soothing the symptoms of fatigue, inflammation, asthma, detoxification, immune disorders, hypertension, and cardiovascular disease. This curative cocktail is based on Dr. Myers’ original mixture of magnesium, calcium, B complex vitamins, and vitamin C.
Promote wellness from head-to-toe with this master mix of essential vitamins and minerals based on the original Myers’ Cocktail. Get your daily dose of youth with this special blend of anti-aging and antioxidant nutrients that enhance how you look, feel and heal. A high concentration of vitamin C protects from free radicals and promotes healthy skin and nails, while vitamin B12 fights fatigue, and trace minerals and magnesium provide an inner peace and outer glow. Refresh your beauty and your body with anti-aging nutrients specially formulated to turn back the clock and turn up your energy. Keep calm and carry on with this relaxing remedy that reduces your response to stress and increases your immunity to illness. The stress-stopping formula includes magnesium for maximum relaxation and heart health, along with the anti-viral value of glycyrrhiza, and the antioxidant protection of vitamin C and B vitamins in this infusion for well-being and wellness. Relax to the max with this tension-taming and adrenal-supporting treatment designed to heal the body and hush the mind. This nutrient IV is made to prepare you for exercise and then repair its effects. Along with a healthy dose of magnesium to fuel you for exertion, its selenium and potassium power your performance, while sodium carbonate enhances your endurance, and high doses of vitamin C foster a faster recovery. No need to sacrifice your wellness to stimulate your skinny. Based on the original bWell IV, this specialized formula adds L-carnitine to help your body burn fat for energy, along with MIC to further eliminate fat and toxins from the body, and chromium for fatty acid and cholesterol synthesis. Thin is in, this specialized formula that supports your slimming efforts by helping you burn fat for energy, flush away toxins, and regulate cholesterol. This fortifying formula is all about replenishing the essential minerals your body needs to maintain optimal function and balance. It delivers a multitude of minerals, along with vitamins and antioxidants, to refresh your supply of vital nutrients often deficient from our daily diets, to leave you feeling fully refreshed. Restore the minerals you need to rebalance and rehydrate your body with this essential, revitalizing treatment. With no extra effort on your part, our medical team can add one of our potent and energy-enhancing blends to the end of your IV infusion, maximizing the benefits of your treatment and super-charging your results. Short on time? Pushes can be purchased separately. For those who need a wellness boost but are short on time, this immunity-enhancing blend packs all the benefits of the Myer’s Cocktail in an instantly effective push. Supercharge your immune system with the antibacterial, anti-viral and anti-inflammatory protection of Collodial silver. A high dose of relaxing and repairing magnesium plus glutathione heals the body, reduces your stress response and promotes deep, restful sleep. This immunity-increasing infusion delivers the benefits of glutathione, which is one of the most potent antioxidants. Its anti-inflammatory properties are extremely helpful in preventing disease, protecting your cells from free radical damage, eliminating toxins, and enhancing immune system functions. Add this powerful push to your therapy to take your health to new heights. Harness your body’s most powerful antioxidant. Glutathione is a supercharged peptide vital to some of your most important bodily functions. As an energizing end to your IV therapy, this infusion provides the antioxidant protection of glutathione and an energy boost from additional methylcobalamin, the most readily absorbed form of vitamin B12, to keep your energy levels at their peak throughout the week. Rev up your health with this energy-enhancing body booster packed with glutathione plus methylcobalamin, the most readily absorbed form of vitamin B12.